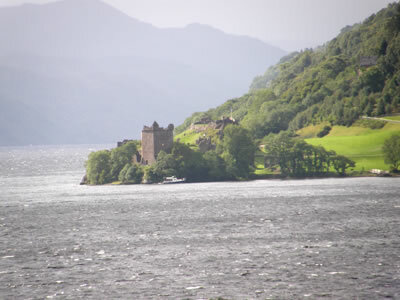 Urquhart Castle was originally a 6th century fortified Pictish residence, founded by Emchath. Dominating the summit of a rocky promontory that juts into Loch Ness, it was replaced in the late 8th or early 9th century by a broch. In the mid 13th century, the Durwards founded the motte and bailey fortress, which is still defended by a wide deep ditch on the open side. During the Wars of Independence King Edward I captured the castle, which then passed back and forth between Scottish and English control until 1308. The large Nether Bailey was probably added by the Comyns in the early 14th century and in 1334 Urquhart was the only Highland castle to hold out against the English. Seized by the Earl of Ross in 1437, the castle was given to the Gordon Earl of Huntly in 1475. In the 16th century, John Grant of Freuchie rebuilt Urquhart adding a tower house, a gatehouse, a hall and the curtain walls. Captured and held by the MacDonalds from 1515-18, in their last raid in 1545 the Islesmen got away with an enormous hoard, which included 20 guns and three great boats. Repaired in 1676, Captain James Grant held the castle against a blockade by the Jacobites in 1689 but in 1692 it was dismantled to prevent it being occupied and soon fell into decay. 16 miles north-east is Inverness Castle and 25 miles south-west is Invergarry Castle. Urquhart Castle is located east of Drumnadrochit, on the west shore of Loch Ness. 16 miles south-west of Inverness, on the A82. The site is owned by Historic Scotland and is open daily, April to September 9:30-6:00pm, October 9:30-5:00pm, November to March 9:30-4:30pm.